Grandma’s egg rolls. Nanay’s lumpia. One of the biggest things I miss about the holidays is reaching for a fried egg roll at my Grandmother’s table. These were always served at parties or at holiday gatherings, but we also got to sneak them in as a snack during the week. My brothers and I would head straight for the large separate freezer in my Granny’s kitchen. She was a mighty cook and she always had something on reserve. Her freezer was always well stocked with egg rolls that could be easily fried up even if it was just frozen a few minutes ago. Just sitting and waiting on those cold shelves were trays of 50 or more egg rolls for us all to enjoy. The first time I tried to make them was when I was living in Milano, Italia far from my family. Luckily, there was a Filipino grocery store in town and I was able to purchase the egg roll wrappers. Sadly enough, to fix my craving I had to rely on a cookbook to figure out how to make them. I remembered how they didn’t quite taste just like Nanay’s (tagalog for Grandmother), something was missing. However, everything in the recipe appeared to include all the ingredients that I recall having to chop up along with my aunts and mother in my Grandmother’s kitchen. What was the difference? The Italian vegetables? The oil? Me? A few years later, when I moved to Prague, my Grandmother along with my three aunts came for a visit. My three titas’ had planned to also explore other cities outside of Prague and so I was going to have Grandma all to myself. Her visit was in the Spring and this city is amazingly golden with sunshine and spectacular to the eye. I decided to take a few days off from work and rented a wheelchair to make sightseeing more comfortable for my Grandmother. I managed to navigate the wheelchair through the uneven cobbles toned streets of Prague. We saw many sights, but the best part of this Grandmother/Grandaughter quality time was finally learning how to make lumpia (fried egg rolls) from my Grandma. Crossing one of the many bridges across the Vlatva River, I brought up making egg rolls with my grandmother. Preparing this simple snack food is not an easy task. It requires great amounts of chopping and slicing, followed by sautéing, furthermore followed by wrapping and finally frying them up. When my Grandmother would make them, she and my aunts would gather together to make hundreds. It was a project that required a tremendous amount of patience and energy, but it also allowed for quality bonding time. Making egg rolls on my own has never been an enjoyable task. A- I don’t have a food processor. B- It would be sacrilegious to use a food processor, therefore it takes a long time to cut the vegetables and C- It’s lonely chopping, sautéing, wrapping and frying them up by myself. Therefore, I have only made them a few times and the most I have ever done on my own were about 20 rolls. Besides, I don’t own a freezer large enough to keep a large number on hand. Grandma was game to help me create a supply of egg rolls in my freezer. Luckily, well maybe I had actually had this pre meditated, I happen to have egg roll wrappers waiting in the freezer. All we needed was to buy the vegetables. At the local potraviny (Czech for fruit/vegetable stand), Grandma was sitting in her wheelchair and instructing me on what to buy if I didn’t already have them at home. Cabbage, sweet potatoes, potatoes, carrots, onions and green beans is what we needed. Her ingredients didn’t seem any different from the vegetables I used to prepare egg rolls. Hmmm…Why weren’t mine not like Grandma’s? “You need to pry the garlic pirst,” she said pressing her fingers together and moving her hand in the air. “But, ov courst! Don’t you know dat??!! !” she said chuckling away. AHA! This was it! This was the secret ingredient that I had missed all this time. GARLIC! GARLIC? GARLIC?!! I had never really noticed it’s flavor in the roll, but I guess a little chopped garlic went a long way. On that sunny afternoon, we assembled about about 45 lumpias. We consumed a few for lunch and saved the rest in the freezer to be enjoyed at a later date. 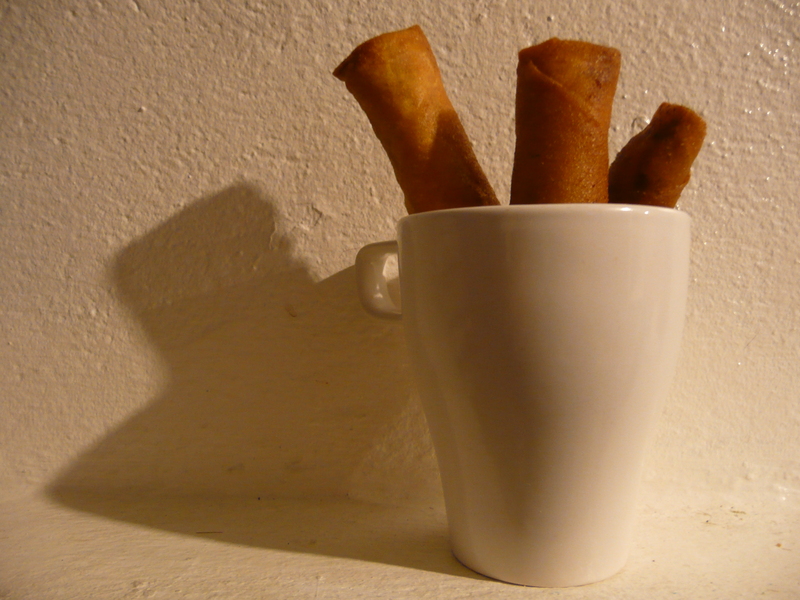 Consequently, the egg rolls finally turned out to be just like Grandma’s. And no, they didn’t last long in the freezer.